SECCON2016 Online CTF - Binary/Crypto500 Obfuscated AES의 Write up 입니다. 올해는 작년과는 다르게 Service상의 취약점에 대한 Exploit에 초점을 맞추기 보다는 Software Protection으로서 몇가지 Mitigation Technique에 초점을 맞추었습니다. White-box AES를 구현했고 LLVM 난독화를 적용했습니다. 개인적으로는 다양한 방법으로 풀리기를 기대하고 있었지만, 의외로 한 팀밖에 못풀었습니다. 시간이 충분히 주어졌더라면 많은 Player가 풀 수 있는 문제라고 생각합니다. APK는 아래 링크에서 다운로드할 수 있습니다. 궁금한점이 있다면 언제든지 연락주세요. 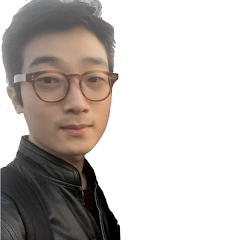 (https://www.cs.colorado.edu/~jrblack/class/csci7000/s03/project/oorschot-whitebox.pdf) 에 대한 공격에 초점을 맞춰서 작성했습니다. 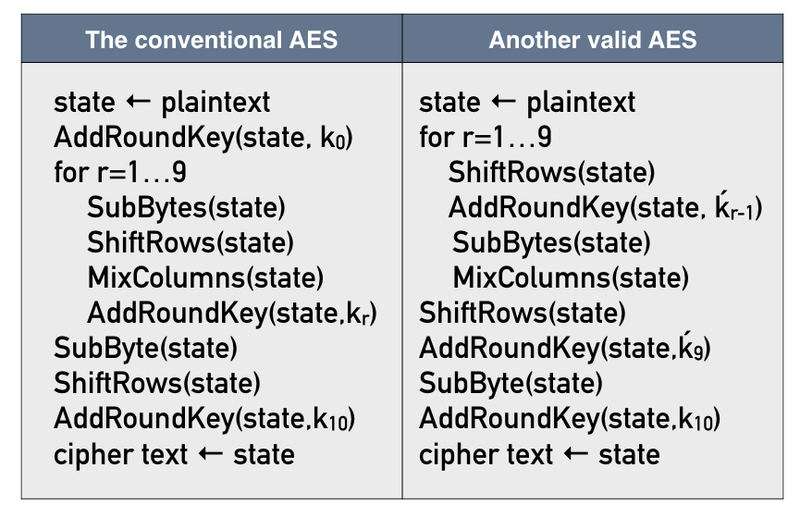 Obfuscated AES는 encrypted Flag를 출력하는 Android Application입니다. 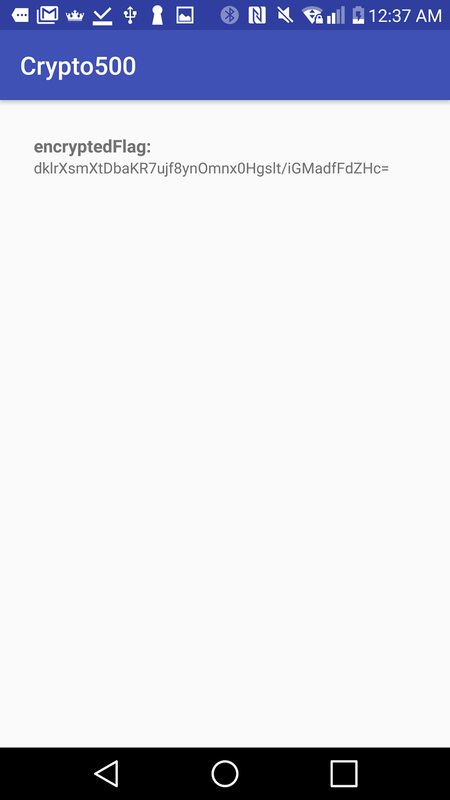 Application안에 숨겨진 secretKey를 찾고 encryptedFlag를 복호화하면 Flag를 얻을 수 있습니다. .apk를 decompile 하면 아래와 같은 코드를 얻을 수 있습니다. 0~3600 사이의 임의의값을 생성하고, 이 값을 index로 사용한다. 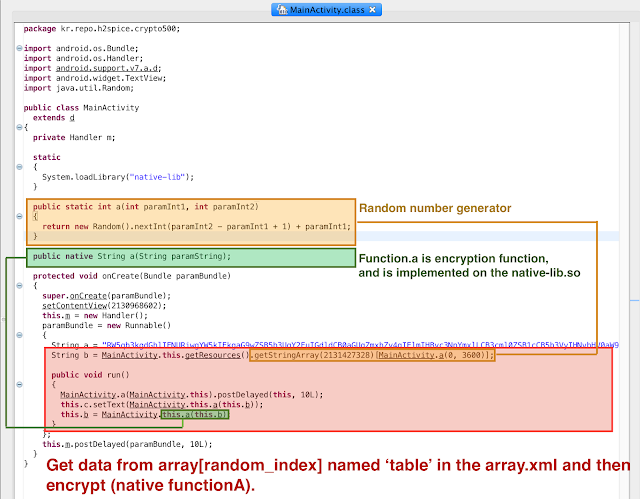 array.xml에 정의된 table(encryptedFlag)[index]의 값 encryptedFlag에 저장한다. 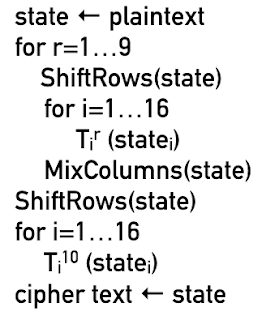 array.xml에 정의된 encryptedFlag는 Flag(plain)를 같은 secretKey로 N(index+1)번 암호화된 Ciphertext입니다. 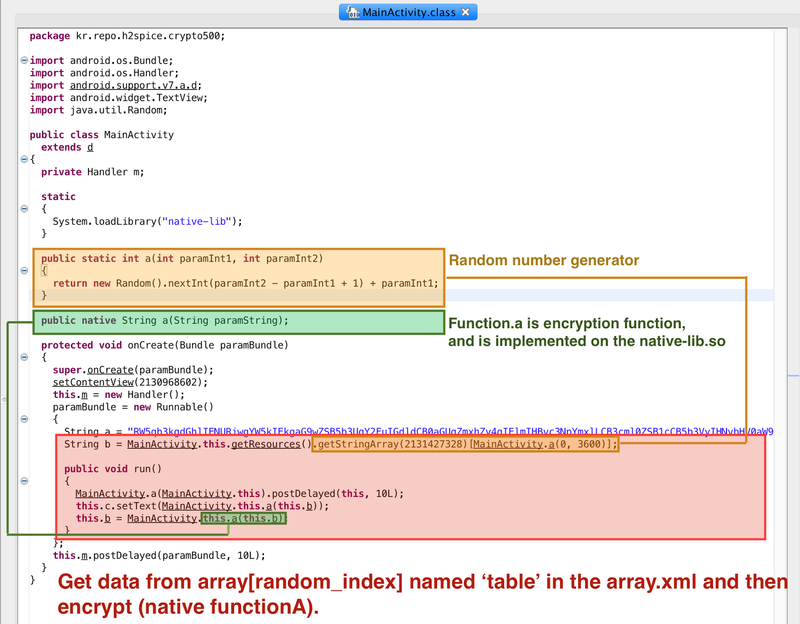 native-liv.so의 function.a (encryption function)으로 encryptedFlag를 암호화한다. 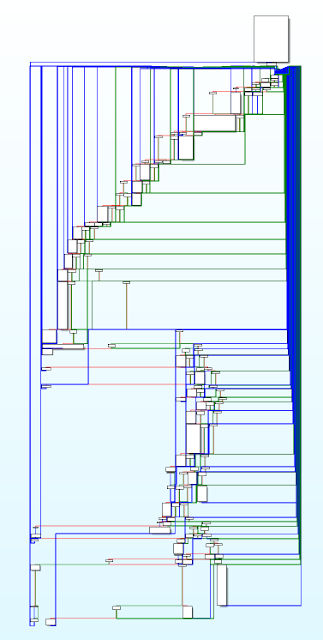 Native Function.a의 Pseudo code(IDA Hex-Rays Decompiler)아래와 같습니다. Java로 부터 전달받은 input data(base64 encoded)를 base64 Decoding한다. 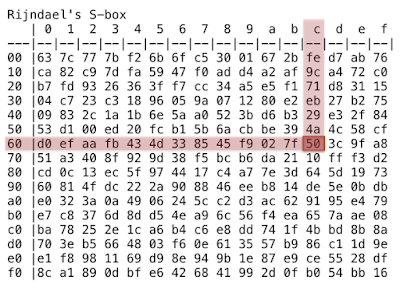 encryption function(TfcqPqf1lNhu0DC2qGsAAeML0SEmOBYX4jpYUnyT8qYWIlEq)을 분석해서 암호화에 사용되는 secret-key를 찾는것이 문제의 핵심입니다. OAES에 구현된 White-box AES에 대해서 이론적으로 간단히 설명하겠습니다. 물론 White-box AES의 이론없이도 충분히 풀 수 있는 방법은 많습니다. Conventional AES Scheme은 아래와 같은 형태로 변형될 수 있습니다. 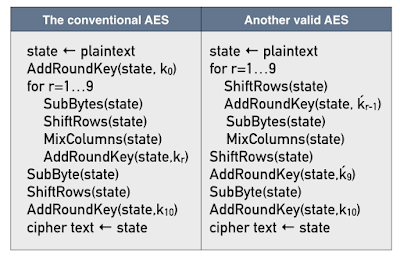 The for-loop can be redefined to bring the transformation AddRoundKey(state, k0) inside it while pushing AddRoundKey(state, k9) out. 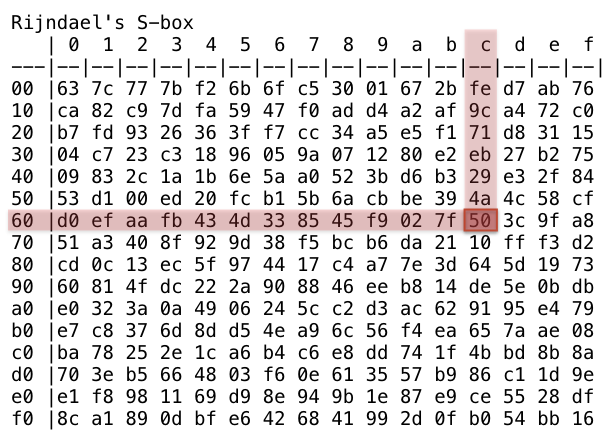 Since SubBytes applies the same S-box to each byte of the state, SubBytes followed by ShiftRows gives the same result as ShiftRows followed by SubBytes. Since ShiftRows is a linear transformation (recall that it is a permutation),AddRoundKey(state, kr−1) followed by ShiftRows(state) gives the same result as ShiftRows(state) followed by AddRoundKey(state, ḱr−1); here, ḱr−1 is the result of applying ShiftRows to the round key kr−1. 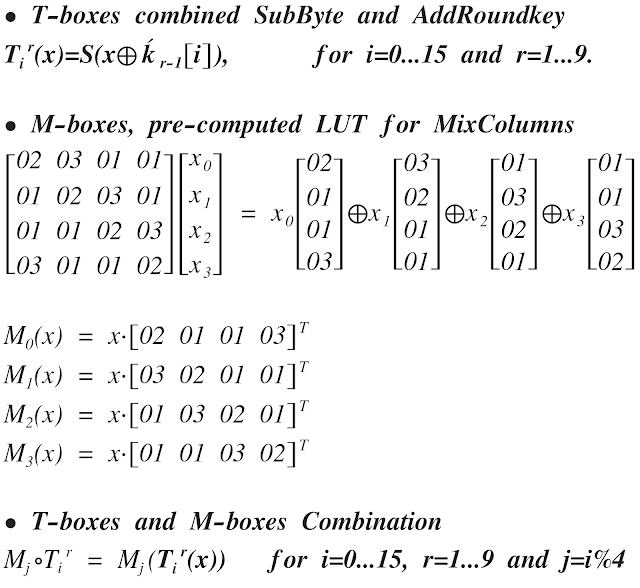 각 Round의 pre-computed KeyTable, T-boxes: SubBytes(AddRoundKey(state,ḱr))을 생성하고, 이 T-boxes기반으로 암호화를 수행 할 수 있습니다. 즉, Round1의 T-boxes는 아래와 같이 생성될 수 있습니다. T-boxes 를 이용한 암호화는 아래와 같습니다. 각 Round의 MixColumns 또한 4개의 pre-computed LUT(M0, M1, M2, M3)로 생성 가능하며, T-boxes와 결합될 수 있습니다. 참고로 MixColumns의 경우 Rijndael's Galois Field의 곱입니다. 일반적인 곱이 아닙니다. T-boxes + M-boxes (M_T-Boxes)는 아래와 같이 생성될 수 있습니다. Encryption Function, TfcqPqf1lNhu0DC2qGsAAeML0SEmOBYX4jpYUnyT8qYWIlEq(unsigned __int8 *in, unsigned __int8 *out) 을 분석하면 아래와 같은 흐름으로 실행됩니다. 바이너리의 Round10에 맵핑되는 T-box는 아래와 같습니다. Encrypted Flag, "g1UlZafiuGdCgpTkWYjaZg3kE6qCd7kF3kV+nMKcGHc=" 를 복호화하기 위해서는 우선 secretKey를 recovery해야합니다. 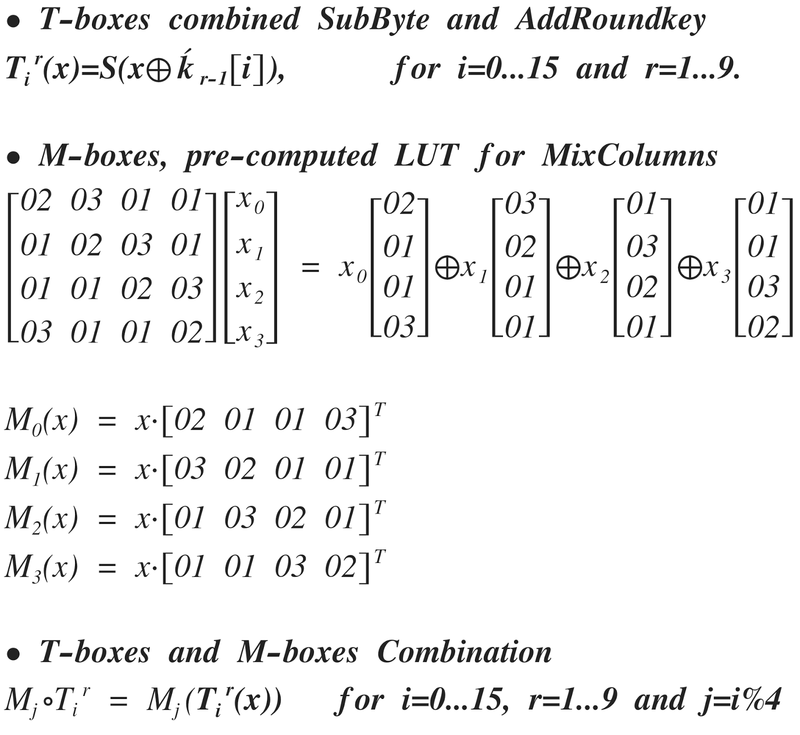 M-boxes는 MixColumns의 Pre-computed LUT로서 ḱ1...16와는 독립적이며 임의로 생성할 수 있습니다. M_T-boxes의 Round1의 LUT은 ḱ1...16에 의존적이므로 M-T-boxes로부터 T-boxes를 분리한다면 secetKey도 복구할 수 있습니다. 아래 수식에서 볼 수 있듯이 x가 0일 경우(M_T-boxes[1...16]) ḱ1...16 자체가 index가 되어버립니다. 그러므로 아래의 단계로 secretKey를 구할 수 있습니다. 4의 M-boxes[index]와 M_T-boxes[j]를 비교하고 같으면 index가 ḱ0[j]가 된다. ḱ0 는 roundKey0(secretKey)를 ShiftRows한 결과이므로 unShiftRows를 하여 secretKey를 구할 수 있다. Therefore, To get the secretKey you need to unShiftRow.